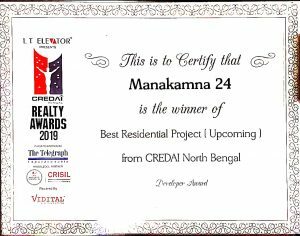 Embee Builders and Manakamna Builders rejoices their win in one of the biggest residential awards platform CREDAI Bengal Realty Awards 2019 by achieving the best completed residential project award for their renowned project Embee Fortune which is a 265 Flats residential project in Kadamtala, Siliguri and for best upcoming project award for project Manakamna 24 which is a 160 Flat upcoming residential project in Champasari. 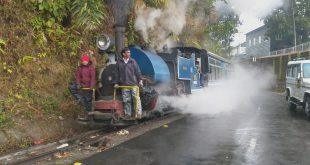 For the first time in Siliguri competing with all builders and developers including builders from Kolkata and all other regions of entire West Bengal, it is a great achievement for a Builder in Siliguri to win the titles of Best Completed Project and best upcoming project awards in entire Bengal. 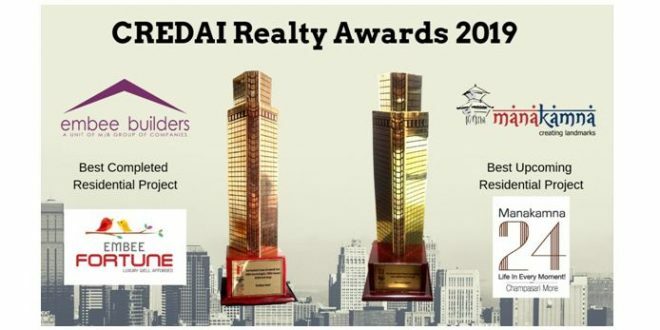 The event was held in Taj Bengal Hotel, Kolkata on 29th March 2019, where all the builders all across West Bengal attended the event, the award for Best Completed Project and Best Upcoming Project award was received by Mr. Durga Prasad Agarwal, Mr. Manoj Kr. 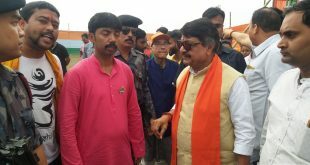 Agarwal, Mr.Vikash Bansal and Mr. Manish Kr. 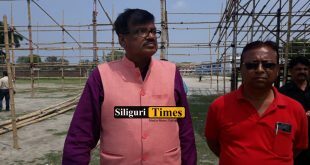 Agarwal the directors of Embee Builders and Manakamna Builders. 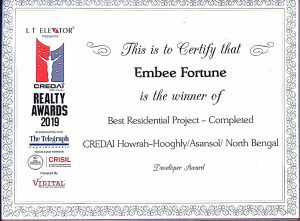 Embee Builders and Manakamna Builders are together now coming up with another renowned project Embee Delight which is a 530 flat residential project at Kadamtala, Siliguri and the builders have pledged to keep up the hard work and are firm to set new records in terms of quality and efficiency for its all upcoming projects.